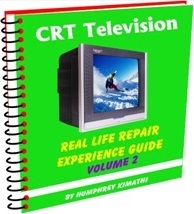 CRT TV Real Life Repair Experience Guide Vol.2 eBook is composed of 10 chapters of pure real life repair histories from the technician work bench. The Book also includes 2 bonus Chapters on do it yourself projects on how you can make your own isolation transformer and installing universal television kit. The book is illustrated with numerous color photos to make the reader get the concept pretty fast.Bearing in mind that most electronics problems in Television are common irrespective of the Television model I believe this eBook will help you in cutting down on time spent troubleshooting and repairing CRT televisions set brought to your workbench.